STC Craft Authors at Vogue Knitting Live in NYC This Weekend! Join STC Craft authors at Vogue Knitting Live! at the New York Marriott Marquis this weekend for signings at the Knitty City booth (#712 - 714), readings, and teaching sessions throughout the weekend. Stop by, say hello, enjoy, get your books signed. Looking forward to seeing you this weekend! 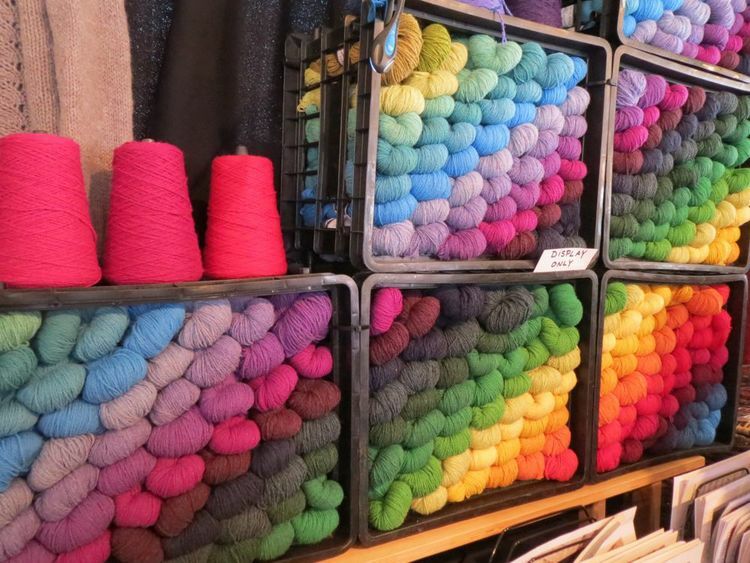 Beautiful Yarn Rainbow from Harrisville Designs. Photo courtesy of Laura Poulette. 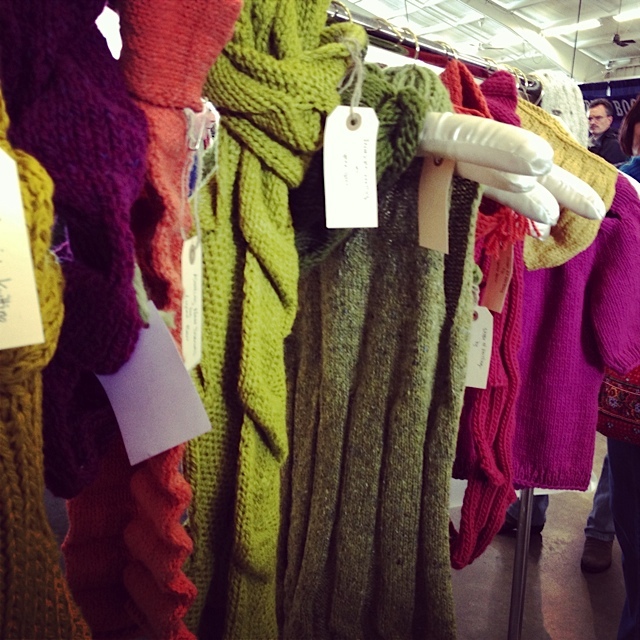 Last Saturday, the STC Craft team spent a beautiful fall wekend in Rhinebeck at the 33rd annual New York State Sheep & Wool Festival (10/19 – 10/20). We were in good company among 40k+ attendees ranging from knitters, crocheters, and handspinners to lots of fiber-producing livestock! We proudly hung our STC Craft banner above a wide selection of our craft and design titles on sale via the Hudson Valley-based Merritt Bookstore. The stars of the day were our fabulous authors, doing demos and signings from the morning opening to the afternoon close. Steady crowds flocking to see The Yarn Whisperer, Clara Parkes, requesting autographs and providing some yarn tales of their own. 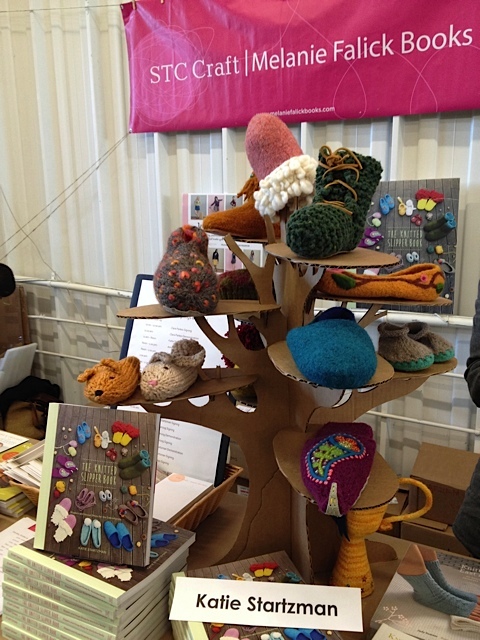 A Knitted Slipper tree for displaying sample projects, made by hand just for the event by the twin sister of The Knitted Slipper Book author, Katie Startzman. Multiple festival attendees greeting Amy Herzog and gushing about how her book has changed their whole knitting experience—we even sold out of Knit to Flatter! Fans of Gretchen Hirsch (in the Shirtwaist Dress from her book!) coming to get their new copies of Gertie's New Book for Better Sewing signed (and to hear about Gretchen's second book, coming soon). Project samples from STC Craft titles on display. With other autumnal-themed treats like fresh cider and homemade jams, live llamas and alpacas, and tons of vendors of yarn and knitting gear, the festival is a great destination for everyone, young and old, who wants to spend a happy day in the country. Plus, the fall foliage makes the trip even more worthwhile! A big thank you to our STC Craft fans old and new who stopped by the booth to meet our authors and check out our books—hopefully everyone got some great ideas for new projects!